Image Medicine was accredited in China Association of Traditional Chinese Medicine. Beijing Medical Research Institute "Kundawell"
The goals and objectives of Institute "Kundawell"
On June 4, 2013 a group of researchers from the Institute "Kundawell" led by Professor Xu Mingtang, visited the head office of the China Association of Traditional Chinese Medicine, where the meeting was held on the accreditation of experts in the field of Image Medicine, School of Medicine Bien Chue. The meeting was also attended by the head of the International Relations Department of the All-China Association of Traditional Chinese Medicine, Mr. Sung Yong Zhan. Deputy director of the Department of International Cooperation of the State Administration of Traditional Chinese Medicine Wu Zhen Dou, General Secretary of the All-China Association of TCM Cao Zhen Kui, Deputy Secretary General of China Association of TCM Xie Zhong, Senior Consultant China Association of TCM Professor Wen Zhan Lou, Secretary of the Department of external therapy China Association of TCM, Party Secretary Acupuncture School of Beijing University of TCM, PhD Professor Liu Jian Guo, chairman of the Center for Cultural and Communication of Beijing University of TCM, vice chairman of the Department of Culture at the China Association of TCM, Professor Mao Jia Lin, a researcher at the Chinese branch of the Academy of Acupuncture TCM Sciences, Professor Gian doctoral Wei Bo, director of basic research in TCM theory of the Chinese Academy of Sciences TCM Ma Xiao Tong, founder and president of the European Association of Needle-Knife (Akupotome), vice chairman of China Association of Acupotome Professor Xiao De Hua, chairman of the China Branch of the information Association of TCM Liu Ping, experts of Beijing Medical Research Institute "Kundawell": chief information officer by Jun Lee, director of education Anna Recun, senior researcher Olga Smirnova, the head of the therapeutic department Zhang Jianrui etc. This is a very interesting meeting, because the association pays a lot of attention in the area of academic matters.Director Wang Chang Guo believes that in order to achieve better results in our field of work, the Association should set academic matters in the first place. In our secretariat, we are constantly exploring new ideas regarding issues of theory and ways of thinking. We have summed up the development of Chinese medicine, and identified a number of key issues related to the development of the science of TCM. They are, above all, a lack of innovation. First, we did not do enough research in the field of cultural heritage of TCM, and secondly, we need the tools of innovation - the modern scientific and technical tools, as well as an innovative way of thinking in the interpretation and scientific explanation of methods, traditions and philosophies of Traditional Chinese Medicine. From the point of view of the academic traditions, we continue to pay particular attention to the academic heritage. Minister Wang believes that first of all it is necessary to strengthen the academic value, the second - authoritative, in the third - comprehensiveness, the fourth - effectiveness. It is necessesary to go deep into the question solutions of the academic value of TCM, to support the development of a number of schools in the conduct of research. Head of the Department of International Relations China Association of TCM Professor Sung Yun Zhan, briefly overview the results of the work that was done in the last two years in the development of creative thinking and innovation in the field of TCM. He talked about the main positions of the theoretical study of TCM, the importance of innovative and traditional thinking for the development of academic medicine theory. Academician Wang Yong Yong said that the science of visual thinking has become one of the branches of the science in study of the brain. Professor of Beijing Institute of TCM, director of the human constitution at the China Association of TCM, leading the research project "973," "The creative thinking TCM and relationship with health," Wang Chi, underlined the importance of patterns of thought, which is based on an understanding of energy, body and Information. And noted that the work, which Professor Xu Mingtan deals with is a prime example of creative thinking and research models. Head of Information department of "Kundawell" Jun Lee spoke about the history of the school Bien Chue, culture, heritage, authors and other aspects of Image Medicine. Professor Xu Mingtang told stories about the origin, theory in science, the basic concepts, performance evaluation, international influence in Image Medicine etc. After Professor Xu Mingtang’s speech was made, director Sun talked about his experience and understanding of Image Medicine: "After spending the last five years in the study of Image Medicine, I realized that at the heart of this science is the theory of TCM original thinking, creative thinking, the basic theory is based on an understanding of the model life Jing-Qi-Shen or Matter-Energy-Information. It's all the guidelines for the regulation of TCM theory of channels and meridians, qi and considering the human body as a single integrated system. During the discussion, Professor Xu Mingtang was asked questions about the theory and practice in Image Medicine. 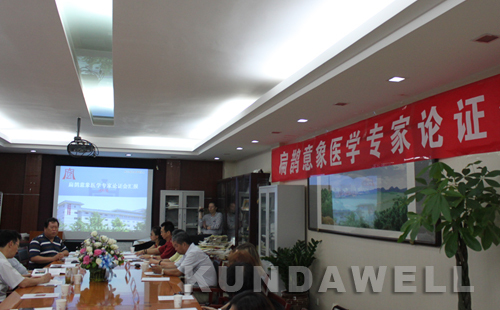 Then the main experts held a closed door meeting, after which it was officially announced: "Image Medicine, founded by Professor Xu Mingtang, now is registered as a part of TCM, its diagnosis and treatment methods, theory and practices comply with the basics of TCM. Image Medicine mental can be used for the treatment of intractable diseases, as new and innovative way. The results of the success of this method abroad speak for themselves. Recommended to further development the theory of pulse diagnosis and the use of creative thinking. " In conclusion, all the experts applauded the resolution adopted by acclamation. Professor Xu Mingtang expressed his deep gratitude to all the experts for the recognition and support, and said that he will make more efforts to further develop the Image Medicine not only in China, but also abroad.